We’re calling it: This is our summer of fruit liqueurs. And before you say it, we know, “liqueur? Ew.” The word “liqueur” has long had a bad rap, thanks to the sticky-sweet cocktail syrups in garish colors that had their heyday two decade back. But they don’t have to be over-sweetened or synthetically flavored. In fact, the best ones manage to capture a powerful, genuine flavor, often fruity or floral, and preserve that flavor in a slightly boozy bottle. Case in point: Giffard Caribbean Pineapple Liqueur. You smell it, you taste it, and the flavor is unmistakable: all pineapple, all the time. It’s bright and acidic just like the fresh fruit, but then evolves into something a little richer, almost caramelized-tasting, thanks to the rum and spice it’s made with. Sweet and concentrated though it is, we’d drink this stuff straight. But it’s far better in its natural habitat: the cocktail. Give these three drinks a try and you’ll be in pineapple nirvana, no clunky juicer required. How do you turn the coconut-pineapple profile of a piña colada into a super-light day drink? Coconut water and pineapple liqueur. (Plus bubbles, of course.) This is a huge, refreshing cocktail that’ll last through an entire brunch. 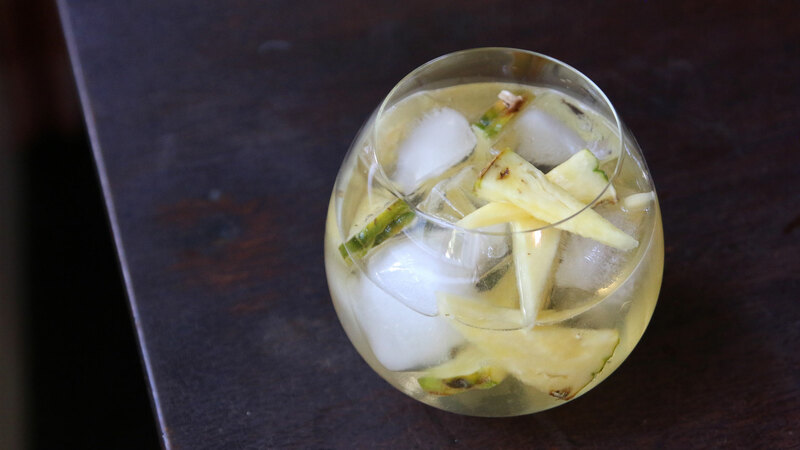 Instructions: In a wine glass or similar large glass, combine 2 ounces of pineapple liqueur, 2 ounces of coconut water, and 3 ounces of sparkling wine over ice. Give a quick stir and serve, garnishing with a bunch of little pineapple wedges. 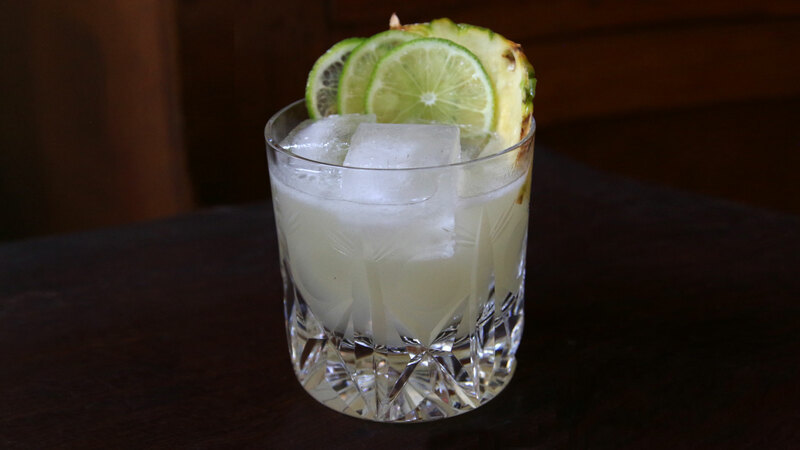 Tequila and pineapple are a natural pairing, but pineapple juice can weaken and dilute a standard margarita. Not so with pineapple liqueur. This drink preserves the bright, punchy format of a great margarita and the pineapple flavor slides in seamlessly. Instructions: In a cocktail shaker with ice, combine 1.5 ounces of silver tequila, 1 ounce of fresh lime juice, 1 ounce of pineapple liqueur, and .25 ounces of agave syrup (that’s agave nectar, dissolved 1:1 in hot water). Shake that all up, strain it into a rocks glass with fresh ice, and garnish with a few lime wheels and a very thin pineapple half-moon, bent around the glass. We’re using this template for a rye sour that takes the slightly spicy whiskey and integrates it perfectly with juicy, fresh pineapple liqueur, smoothing out all the edges and creating a light, almost delicate cocktail. 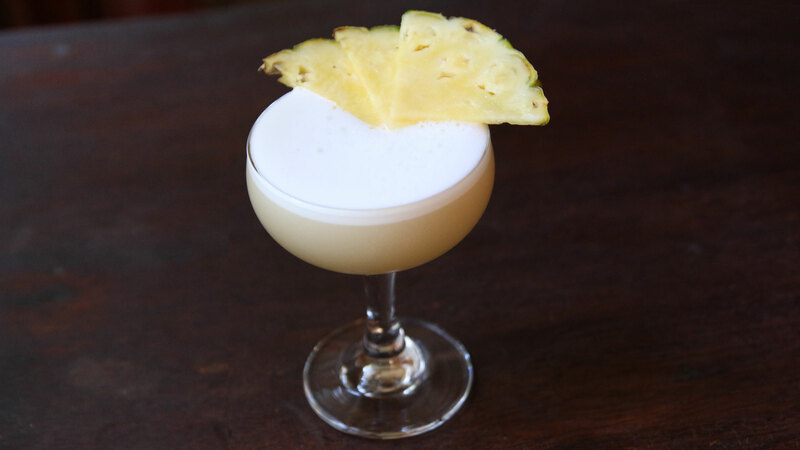 Instructions: In a cocktail shaker without ice, combine 1 ounce of rye (we’re using Rittenhouse), 1 ounce of pineapple liqueur, .75 ounces of fresh lemon juice, .25 ounces of simple syrup, and 1 egg white. Shake all that up without ice to aerate it — that’s called a “dry shake” — and then add ice and shake again for a “wet shake,” to chill it down. Strain into a cocktail glass. Garnish with a few thin pineapple slices.